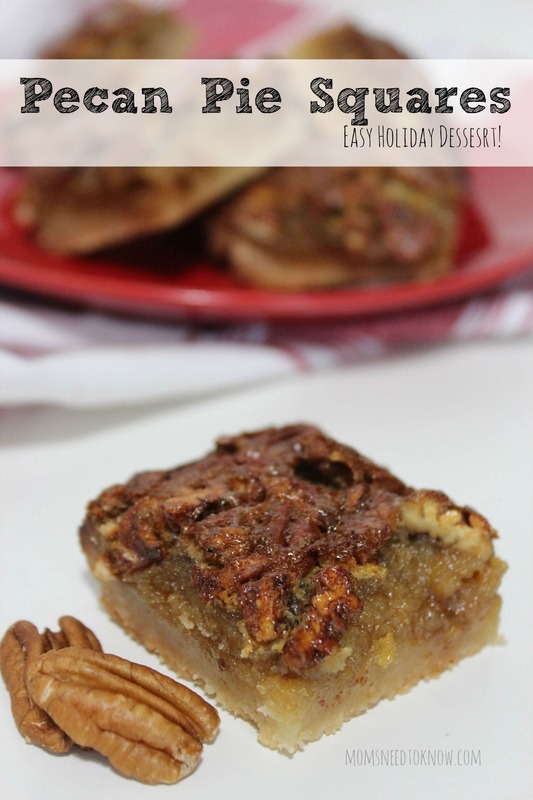 Pecan pie is a must at many holiday dinners…but my biggest problem is that I can never eat a full piece, especially when there are so many other desserts to try (my family is really big on doing desserts. If there are 12 people at Christmas or Thanksgiving dinner, chances are we have about 9 or 10 different desserts!). Pecan pie is the perfect combination of gooey and sweet, and a good pie crust tones down the sweetness just enough. I really just need a bite to be satisfied (until the next holiday) and that is where these pecan pie bites would be perfect for your next dessert table. Not only does it allow you to keep an old favorite on the table, i is perfect when it comes to potion control (and if you cut them up and place them on a serving platter, you can free up a pie slicer for another dessert! I know that I often tell you to use parchment paper for baking, especially with dessert bars, but this is one recipe where parchment paper would be a really BAD idea. Unlike my Pumpkin Cheesecake bars or these delicious Caramel Apple Cheesecake bars, the filling would stick to the parchment paper and make a huge mess! Spray bottom and sides of 8x8" pan with cooking spray. « Is a Disney Cruise Worth the Money? I just made my first Fabric Softener using Suave “Clean Breeze” 30 oz. bottle from Walmart. The clothes came out smelling wonderful and feeling very soft! Just wished I had known this recipe years ago! I love doing this myself and saving ALOT OF MONEY!!! Thanks For All You Do To Help Us!! We’re reading and paying attention!